Safekeeping is a realistic way to model locking as it is a common practice in many industries. For example, during a real estate transaction, purchase funds are transferred to the sellers lawyer’s escrow account after the contract is signed and before closing. To understand its implementation, review the original Coin template first. There is no need to make a change to the original contract. With two additional contracts, we can transfer the Coin ownership to a locker party. LockRequest has a locker party as the single signatory, allowing the locker party to unilaterally initiate the process and specify locking terms. Once owner exercises Accept on the lock request, the ownership of coin is transferred to the locker. 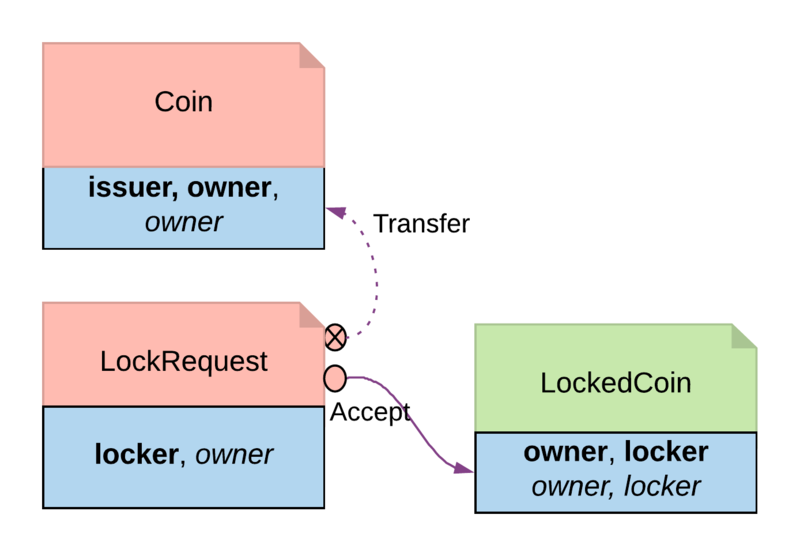 The Accept choice also creates a LockedCoinV2 that represents Coin in locked state. LockedCoinV2 represents Coin in the locked state. It is fairly similar to the LockedCoin described in Consuming choice. The additional logic is to transfer ownership from the locker back to the owner when Unlock or Clawback is called. Ownership transfer may give the locking party too much access on the locked asset. A rogue lawyer could run away with the funds. In a similar fashion, a malicious locker party could introduce code to transfer assets away while they are under their ownership.